(MP085). Leslie A Wilcox, RI, RSMA (1904-1982). Oil on canvas, signed.. The provenance of this painting is fascinating. 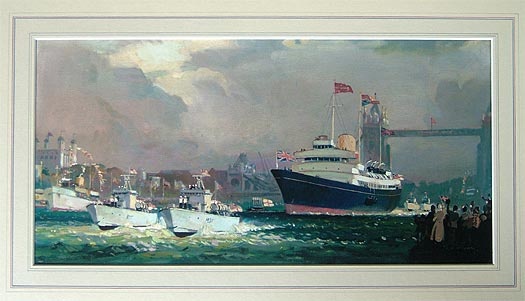 Painted by Wilcox in, it is thought, late 1954, it was used as trial run by him for the very much larger painting which he had in mind and which, when subsequently completed hung for 44 years on the after bulkhead over the fireplace of the Royal drawing room in BRITANNIA. Comparison between the two (the larger one, some 5 x 3 feet, now hangs at Frogmore together with other BRITANNIA artefacts) shows that the artist did decide to make one or two small amendments before completing his larger masterpiece: these were mostly in the area of flags and small details to BRITANNIA’s upperworks. But the picture is essentially the same as the one that sailed 1,087,623 miles around the globe during the Yacht’s 44 years of service.